This causes a terrible reaction, not from Melanie, but from Sergeant Eddie Parks (Paddy Considine). He reminds her of what the children are. Despite their ability to speak and learn, the children are all infected with a fungus that has attached to their nervous system. When around anything that is not infected, they become ravening monsters. In fact, the humans at the base are surviving around the children only because of a scent-masking gel that they use. Also at the base is Dr. Caroline Caldwell (Glenn Close! ), who is using the children in an attempt to find a cure for the fungal infection. But this would be a dull movie if that’s all we had happen, so naturally things are going to get hairy pretty quickly. The hungries—infected people—are massing outside the base and are starting to knock down the fences. Dr. Caldwell, Justineau, Parks, and a couple of other soldiers escape, bringing Melanie along to allow Caldwell to continue her research. So, as I said above, there’s definitely a zombie connection here even if the hungries aren’t actually undead. One of the better things about the film is just how much thought has gone into the plague. Unlike many other zombie and zombie-like films, this does feel extremely real in a lot of ways. For Romero’s zombies, we never really learn why it’s happening. In 28 Days Later, the infection is given a clear starting point, but we never learn why the infected don’t attack each other. That’s clearly covered in The Girl with All the Gifts. The hungries hunt by scent, and presumably the scent of the fungal infection prevents them from seeing each other as potential prey. We also learn why these 20 children have cognitive abilities: they are all second generation hungries, having been infected while still in utero. The last couple of years have been great for horror movies. Honestly, given the state of the world, that’s not terribly surprising. Having an actor as accomplished as Glenn Close showing up in a relatively low-budget (roughly $5.5 million) horror film is shocking at first, but also incredibly welcome. It gives the genre much-needed credibility, as does a film this good in general. 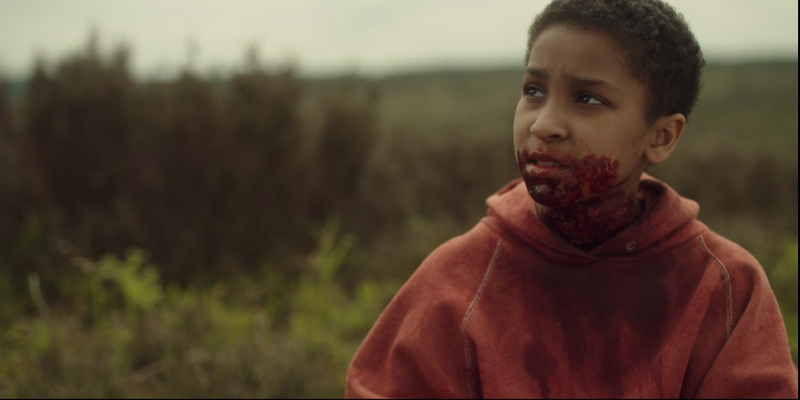 In addition to being a horror film, The Girl with All the Gifts is also a science fiction film, and like the best and most interesting science fiction, it asks the most interesting question. That question is, “what makes us human.” Through the bulk of the film, Melanie is treated as an object by everyone except for Helen Justineau, who sees her as a person. As the film progresses, more and more of the characters come to understand that while she is infected and cannot control herself when faced with potential prey, she is still essentially a human being, albeit it one in a symbiotic relationship with the fungus. I love how much thought went into this. I love how much detail is here about the life cycle of the fungus as well as how much this hearkens back to zombie films while presenting something entirely new. The tensest scene in the film comes when the human survivors are forced to walk through a gauntlet of hungries, who generally stand motionless unless roused by potential prey. It is absolutely terrifying in the moment, and the sort of thing for which movies get remembered. The biggest discovery here is Sennia Nanua in just her first feature-length role and second role overall. Nanua is wonderful on screen, completely engaging, and fully willing to go from pleasant, happy child to blood-mad ghoul in seconds as needed. On her IMDB page, she is not listed for being in any current or future projects. I hope she continues her career, because she is tremendously good. The rest of the cast, particularly Close, Considine, and Arterton are as good as they ever are, and the three of them in particular make much of the film work. I could write a lot more about this film, but I’m not going to. This is not one to have spoiled for you. Suffice it to say that it’s well cast and acted and a hell of a lot smarter than a zombie-like movie has any right to be. Why to watch The Girl with All the Gifts: The British are making the best zombie and zombie-like films of late. Why not to watch: It will start up the zombie/not a zombie arguments all over again.